Nature is full of patterns. These patterns are found from non-living microscopic to gigantic structures and from living single cell life forms to complex multi-cellular animals. Greek philosophers to modern scientists have studied these patterns and tried to make sense out of them. They figured that these natural patterns are governed by incidents and natural selection, and can be mathematically modeled in some cases. Whatever can be modeled mathematically, can be bound in rules, mapped and identified. Many natural and universal affairs are governed by fundamental principles and never seem to contradict them, for example: Gravity. Gravitational force from huge masses like planets and starts, have always been experienced to be a pulling force, and it was never observed repelling objects. Despite their existence, fundamental principles are observed by experience, they do not come in writing. After experience and observations, they are taken as principles that never contradict themselves. The same theory applies in case of fingerprints. Fingerprints are natural unique patterns formed by friction on epidermal ridges (raised) and furrows (recessed), which appear on the pads of fingers and thumbs. Though these epidermal ridges are found on fingers, palms and soles, they are popularly called just fingerprints. They have never been observed repeating in any human being in the history of Dactylography (Fingerprints are also called dactylograms and study of fingerprints is called dactyloscopy or dactylography). Study and understanding of fingerprints have mostly helped forensic science to prove the presence of someone at a location. This has been associated mostly with the crime scenes and legal proceedings, until 21st century, when fingerprints started playing important role not only for identification of criminals, but also in day-to-day identification needs. For example: Employee attendance systems are now very common at offices and industrial plants. Educational institutes like schools and colleges have also been using fingerprint scanner for attendance and many other applications. Financial institutes are coming up with fingerprint and other biometric authentication methods to verify identity of their customers to handle cases of frauds. When industries and financial institutions started adopting technology to expedite their operations, identity management stayed on traditional mode, mostly because organizations invested on technology for their core functions and ignored identity management part. This kept identity management on traditional mode, which remained a time intensive process even in fast paced technology driven environments. But when technology based identity management methods were started working on, fingerprints received their due attention. With increasing production and induced demand, fingerprint based solutions became cheap and it made organizations to consider replacing their traditional methods of identification to fingerprint based one. Due to the simplicity and good history with forensics sciences, fingerprints became the widely used identification method, from attendance systems to access control and from unlocking phones to authenticating payments. This first fundamental principle of fingerprints describes their uniqueness. According to this principle, a fingerprint is an individual characteristic and no two fingers are found to have identical ridge patterns. This characteristic is so individual that even identical twins, who share same genetic code, do not share fingerprints. Fingerprints are believed to be formed during the growth of the human embryo and by the time it is six months old, fingerprints are formed. This fundamental principle states that fingerprints, during the life time of an individual, remains unchanged. They may enlarge with physical growth, but the patterns stays the same, just like inflating a balloon doesn’t change what’s printed on it. This is the most significant characteristic of fingerprints that makes them useful for identity management, authentication and biometric applications. Even the signature of a person, which is considered a behavioral biometric, may change overtime, but fingerprints remain unchanged during a person’s lifetime. Fingerprints never change themselves but in some cases, due to wear or damage (for example, severe burn or working in certain industries) they may distort or disappear. Being on fingertips, they are always the first point of physical contact, however, they are not damaged by superficial injuries. Some medical conditions can also cause fingerprints to disappear. First encounter with fingerprints make them look complicated. They may leave you wondering that how forensic and law enforcement people make use of them. 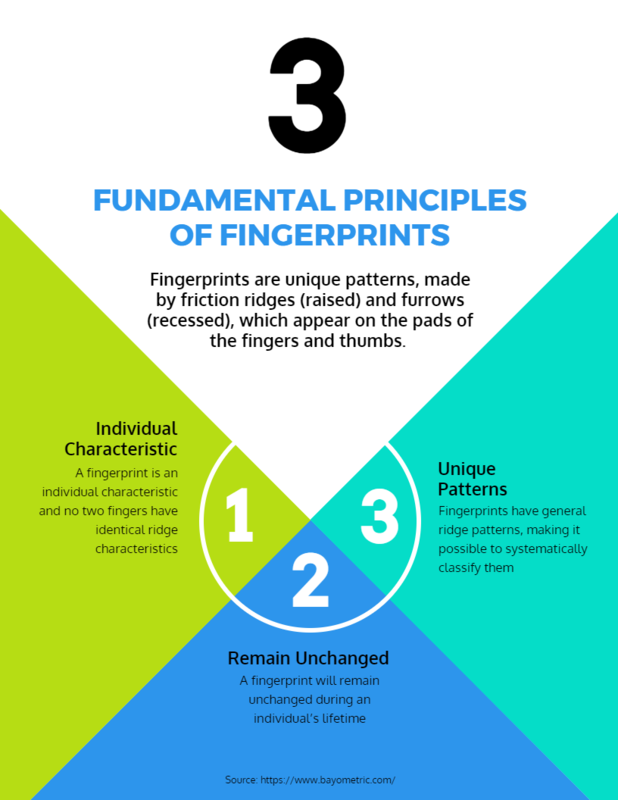 Fingerprints may look complicated, but the fact is that they have general ridge patterns, making it possible to systematically classify them, and that is the third fundamental principle of fingerprints. 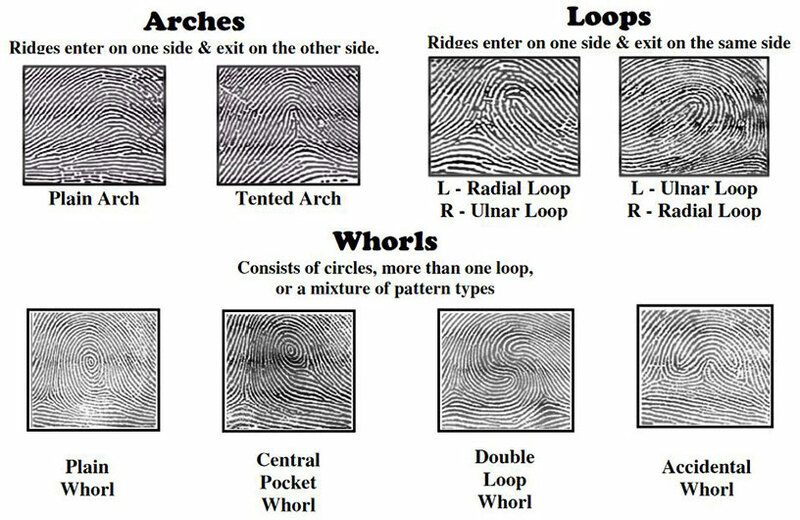 Fingerprints have three basic ridge patterns: “arch”, “loop” and “whorl”. In this pattern type, ridges enter on one sides and exit on the other side. 5% of total world’s population is believed to have arches in their fingerprints. This pattern type has ridges entering on one side and exiting on the same side. 60 – 65% of world’s population is believed to have loops in their fingerprints. Consists of circles, more than one loop, or a mixture of pattern type. 30 – 35% of world’s population is believed to have whorls in their fingerprints. It was never prevised that fingerprint science, which was used for catching criminals, would be used for unlocking mobile phones and authenticating payments. Phones instantly unlock when a finger registered with it, is put on the sensor, but it refuses to recognize the finger next to it, that’s when uniqueness of fingerprints is practically felt. The science going behind unlocking a phone is pretty much the same as the science behind FBI’s automated fingerprint recognition system or EuroDac. Automated Fingerprint Identification System (AFIS) is a system that can take fingerprint as input query can find a match in its database. AFIS contains fingerprint identification algorithm that does the job of matching fingerprints and producing results way faster than manual process. Fundamental principles of fingerprints are what came out of years of experience. Since the establishment of first forensic professional organization, the International Association for Identification (IAI), in 1915, fingerprints records are kept in professional manner and there is no record of two fingers sharing same epidermal ridges. Fundamental principles of fingerprints are the fundamental qualities of fingerprints as well and these qualities make them an ideal solution for many applications that has been a challenge for years, identity management is one of those challenge. Establishing identity with fingerprints is way faster, efficient, secure and permanent than traditional card or document based identity methods. Identity once established, can be verified for a number of purposes. For example: Most of the government departments issue their own identity card or document for identification purposes. A person has to carry multiple cards for different purposes, but with fingerprints, a unified identification system can be implemented that will save a lot of time wasted in verification of identity. Fingerprints can also be used for authenticating digital identity and how user information is used by online services. Except identification and authentication, fingerprint based access control can introduce an additional layer of security in physical security implementation. What can be better than natural characteristics of a person become his or her identity? Wherever identification is a need, these unique natural patterns can serve. What example can be bigger than Federal Bureau of Investigation’s Integrated Automated Fingerprint Identification System, that has fingerprints of 70 million criminals with 73,000 known and suspected terrorists. Fingerprints are saving lives, aren’t they?